Starting out as simply ‘UK Living’ back in 1993, it became Sky Living in 2011. It is now best known for its American programming, with some of its biggest hits being Elementary, The Enfield Haunting and The Blacklist. 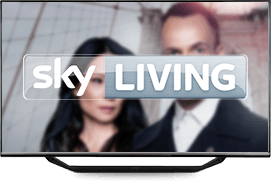 Sky Living is available via any Sky TV deal, including Sky TV and broadband bundles, but it's also on offer to subscribers of oher TV services, so you don't need to sign up for a premium package or install a satellite dish to get access. Looking to buy Sky Living packages? Our comparison table has everything you need. At Broadband Genie we pride ourselves on bringing you the most up-to-date TV deals and offers from all of the UK’s leading suppliers. But if you want to learn more about Sky Living – or what we do at Genie – read on. Sky Living is the place to go for top entertainment for the whole family. In the past its biggest hits have included introducing UK audiences to the likes of Grey’s Anatomy, Criminal Minds and Boston Legal, and it boasts a strong roster of drama shows to this day: including Nashville, Madame Secretary, Shades of Blue and Chicago Fire. Beyond drama there’s a strong mix of reality, chat and makeover shows with favourites including America’s Next Top model, Styled to Rock and of course Jerry Springer. Overall it was one of the UK’s favourite lifestyle channels. How can I watch Sky Living? Unlike some of Sky’s channels, Sky Living is a little more available than most. It is included as part of any of the Sky TV packages, available on standard and high definition as well as a ‘plus one’ channel (starting an hour later, for all of us who get caught in traffic on the way home!). If you opt for Sky you can also enjoy your favourite programmes in a host of online formats. You can stream your favourite Sky Living shows via the Sky Go app (available on the go via Wi-Fi on any android or Apple smartphone or tablet – as well as on a PC or laptop). And of course there’s catch up available when you sink up your Sky+ box with your broadband. Some Virgin TV and TalkTalk TV packages also include Sky Living in their packages (you can compare these deals in our comparison tables), but unfortunately it’s not available via BT TV. Another way to enjoy Sky’s channels is through NOW TV – a monthly subscription service where you don’t need to sign a long term contract. This means it doesn’t have the cheapest deals, but it is super convenient and available through everything from smart TVs to smartphones and games consoles. We’d be remiss to not mention broadband and TV bundles here too, as it can be a great way to get cheap TV deals. You’ll find prices drop the more you bolt onto your deal, so why not take a look at what you’re paying for your broadband at the same time? It’s never been easier to switch and at Broadband Genie we give you all the tools you need to help you compare packages from all of the UK’s leading suppliers – as well as reviews, help guides and other tools. You’ll be amazed at the savings you can make by putting all your entertainment on one bill, making your life easier at the same time.